How do you know it’s time to repot a favorite houseplant or perennial container planting out on the veranda? Spring and winter are good times to check for plants that require repotting, but anytime a plant becomes pot bound is a good time to repot. 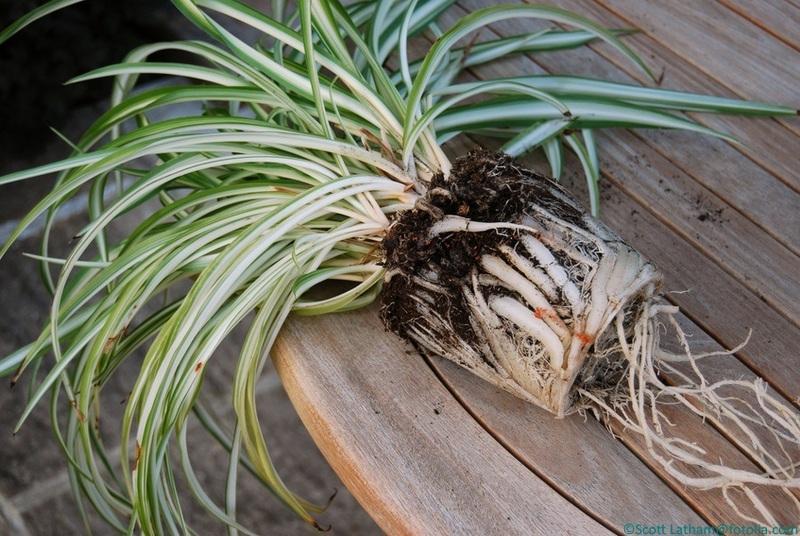 A plant is likely pot bound if the roots are coming out of the drainage holes, or the plant is no longer growing as expected despite proper watering and feeding. Gently try to ease the plant out of the pot, tapping the pot on its sides if necessary, and if you still can’t loosen the plant, water it lightly and let the soil moisten for a while before trying again. If it’s pot bound, the roots will be massed up against the sides of the pot, even if they’re not shooting out the bottom of the pot. If you want to keep the plant in its current pot, then you can prune the roots (be sure to use sterile tools if the plant in question requires it), trim back the plant itself, refresh the soil, and repot it right back into its original container. There’s an excellent video tutorial below on root pruning and repotting plants back into their original container. If you’re replanting into a larger pot, there’s no need to prune the roots, but you can trim those long ones that were sticking out of the drainage holes. Be sure to use potting soil or a suitable planting mix, rather than garden soil, to avoid introducing diseases and pests from outdoors into your indoor environment. 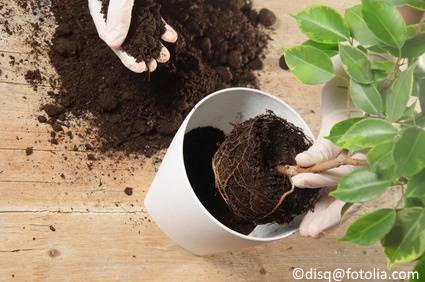 Make sure that you have sufficient soil in the bottom of the new pot to allow room for roots to grow downward. After you fill in the sides with new potting soil, tamp it down gently to make sure things are settled in. You don’t want to bury your plant in the new pot, so maintain the same soil level as in the original pot. When repotting into a larger container, first add sufficient dirt at the bottom of the plant’s new home to allow for downward root growth. If the roots are tightly packed, you may also want to loosen them up a little. Some plants don’t tolerate root damage, so be sure to know before you start frizzing up those roots. 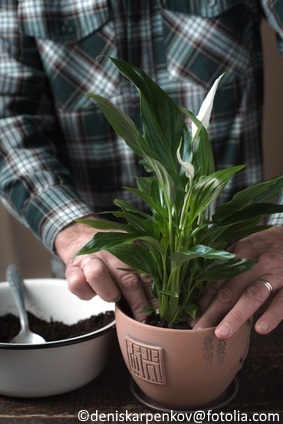 After the new pot has been filled with fresh potting soil under and around the plant, tamp it down to ensure there are no air pockets and that the soil level on the base of the plant remains the same as it was before repotting. In other words, don’t bury the plant in the soil any deeper than it was in the old pot. How big a pot is too big for a first planting or repotting? The new container into which you’re planting should be just a couple of inches larger in diameter and depth than the pot where the plant is currently living. Too large a new pot will overwhelm the plant, often leading to root rot and the death of the plant. What types of pots work best with which types of plants? It mostly depends on what you like, but plants, such as orchids, that require extremely good drainage have very specific pots in mind. Pots and containers come in all manner of materials, from plastic to clay, glazed ceramic, wood, and metal. Some have drainage holes, and some don’t. Clay pots are among the most practical, as they are porous, allowing excess moisture to evaporate. While they usually require more frequent watering, calcium, minerals, and salts are wicked to the outer surface of the pot, rather concentrating in the soil. Glazed ceramic pots and containers are beautiful, and usually have drainage holes. Pots without drainage holes can be drilled if the material readily accommodates it. Containers without holes can still be used by inserting a plastic liner if the interior requires protection from water, and setting a smaller pot containing your plant onto an elevated surface you’ve created at the bottom of the larger pot, so that the plant roots aren’t always sitting in water. The bottom line is that if you don’t provide a mechanism for drainage, your plant will rot. 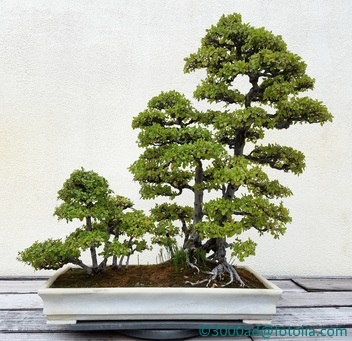 Even a bonsai forest needs repotting and root pruning to maintain its diminutive stature and health. Performing these tasks requires training and experience, but fortunately, you don’t need all that to repot most houseplants or outdoor container plants. Pots with drainage holes also require a waterproof saucer to collect excess water that the potting soil cannot retain. Sizing the saucer appropriately and knowing when to stop watering the plant requires some attention to prevent ruining the surface on which the pot and saucer sit. If your pots are outdoors, and mosquitoes hatching in the saucer water are a concern, try putting a piece of copper in the saucer. Mosquito larvae will not fully develop in the presence of copper and die before maturing. A copper disc about the size of a nickel will do. Since pennies are plated, they may not be as effective as a piece of solid copper. A piece of brass with sufficient copper content will also work. Orchids can become potbound, too. As with bonsai, repotting orchids requires some training and experience. 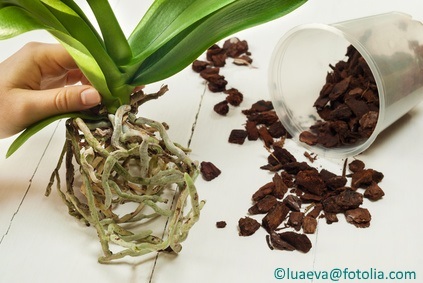 Sterile tools are required when pruning orchid roots, and the pot into which it’s being repotted should also be sterilized. The planting medium should be refreshed at this time as well. For more information on repotting, container types and sizing, and growing mediums, check out the webpages listed below. If you’re repotting plants with very specific requirements, such as orchids or bonsai, it’s best to search for specific tutorials and guides so that you give your plants just what they need to keep on growing. Here are some tutorials and tips on repotting. Here are some tips on container selection and growing media.